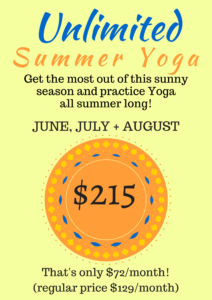 We know how challenging it can be to keep up with a regular practice during the summer months — the weather is beautiful, the kiddos are out of school, and schedules fall by the wayside with last minute getaways, bonus hours of daylight, and extra socializing and sport partaking! So it just makes sense… taking advantage of our Unlimited Summer Yoga pass is the way to go! >>> It’s discounted heavily, so you don’t have to worry about ‘wasting’ your money on the days when you’re a little busier! >>> It’s 3 months long, so you can practice when you can and you don’t have to worry about expiration dates, OR your bank account balance – it’s already taken care of! >>> If you currently have a 5 or 10 Pack Pass, we’ll put it on hold for you, and on September 1st you can pick up right where you left off! This pass is valid Friday, June 1st to Friday, August 31st, 2018. Purchase any time you like, and it will activate on the 1st of June. AND one last thing to make the deal even sweeter… you’ve got TWO WEEKS to take advantage of LAST YEAR’s price of $199! Purchase before Friday, May 18th to get this Early Bird pricing!! Are you ready to make your summer even MORE awesome? Purchase now! < Previous Heated Yoga in the Summer?? You bet!